Kansas City City Hall is located at 414 East 12th Street, Kansas City MO 64106; phone: 816-513-3360. Photo: Robert Alexander Long House (Corinthian Hall), ca. 1910, now the Kansas City Museum of History and Science, 3218 Gladstone Boulevard, Historic American Buildings Survey [HABS-MO1863], Jack Boucher, photographer, 1986, memory.loc.gov, accessed February, 2011. Kansas City had its beginning in two roaring frontier settlements: the Missouri River town of Kansas, and the bullwhacking, feverish town of Westport, four miles to the south on the Santa Fe Trail. The town of Kansas originated in the post which Francois Chouteau, an employee of the American Fur Company, established in the Kaw River bottom, in the spring of 1821. Chouteau's post served as a depot from which the other posts of the company could be supplied and their furs collected. With Chouteau came traders, trappers, laborers, and voyageurs with their wives and children—15 or 20 families in all. When a flood destroyed Chouteau's warehouse about 1830, he moved his post a few miles east to the foot of the present Grand Avenue, where Peter Roy had established a ferry in 1828. After the Independence had proved the Missouri River to be navigable by steamboats in 1819, and the Indians had been removed in 1825, western Missouri began filling with settlers. Jackson County was organized in 1826, with the county seat some ten miles east of Chouteau's settlement, at Independence; this rapidly "became the principal outfitting point for wagon freighting to Santa Fe and northern Mexico, and for emigrants to Oregon in the early 1840's. The trail to Santa Fe lay west from Independence, crossing the Big Blue River some four or five miles south of the Missouri River. West of this ford and the long hill beyond it, John Calvin McCoy built a store in 1832, to cater to the needs of those returning from the Southwest, and to catch some of the overflow business from Independence. The following year he platted the town of Westport, offering lots to newcomers on condition that they build and conduct some kind of business. Westport merchants received their goods by steamboat at the ferry landing four miles to the north, where Chouteau had established his new post. The town soon vied with Independence as the eastern terminus of the Santa Fe Trail. Guests at the historic Harris House, which stood at the present corner of Fortieth and Main Streets, included General John C. Fremont and Francis Parkman, the author. The latter wrote in 1846: "Westport is full of Indians, whose little shaggy ponies were tied by dozens along the houses and fences. Sacs and Foxes, with shaved heads and painted faces; Shawnee and Delawares fluttering in calico frocks and turbans; Wyandottes dressed like white men, and a few wretched Kansas wrapped in old blankets, were strolling about the streets. Whiskey circulates more freely in Westport than is altogether safe in a place where every man carries a loaded pistol in his pocket." The discovery of California gold did not provide the same impetus to Westport that it gave to other Western towns, for in 1849 Asiatic cholera, brought by the gold-seekers, broke out. When the gold rush subsided, and the railroads were extended to Fort Leavenworth, Westport had little further reason for existence. Meanwhile, the settlement at Chouteau's Post, called "Westport Landing" by both Westport and Independence, had grown into a prosperous community. The opening of the Platte Purchase in northwest Missouri for settlement in 1836 had brought both immigrants and trade. When Ceran St. Vrain and William Bent, famous fur traders on the upper Arkansas River, began hauling their freight direct to the landing in 1845, they established a precedent which was followed by others. Soon "Westport Landing" was an active community with a thriving trade of its own. When Gabriel Prudhomme, who owned the land, died in 1838, the "Kansas Town Company" purchased his farm of 271 acres for $4,220, platted it into lots, and named it Kansas. The original town site was the land now bounded by the Missouri River, Broadway, Forest Avenue, and the section line that crosses Main Street at Missouri Avenue. A disagreement among the investors restricted development until 1846, when the company was reorganized, and another sale of lots was held. The population was then 700. The Santa Fe trade brought new business to the village. Five or six steamboats were sometimes unloading their freight at the levee at the same time. The streets were filled with spenders, gamblers, and the roistering brotherhood of the trail. Oxen bellowed and mules brayed while lusty drivers, cursing in a dozen languages and dialects, cracked their long whips. The outbound Mexican trains were laden heavily with whisky, for which there was an insatiable demand. What loading space was left was packed with groceries, cotton goods, notions, and Indian trade goods. Returning caravans were freighted with furs, buffalo robes, dried buffalo meat, Mexican dollars, and, eventually, with rawhide sacks of gold dust. Within a period of 5 months during 1848-9, some 900 wagons started on their journey from the village. About 2,000 travelers were outfitted here in a trade estimated at $5,000,000. When the cholera epidemic broke out, the boom collapsed, and for the next six years most of the trade went elsewhere. The population was more than halved. Nonetheless, a charter was obtained incorporating the village as "the City of Kansas," February 22, 1853. By 1855 much of the overland trade had returned. Grand Avenue was graded and widened that year, and soon four other streets were cut through the bluffs and cross streets were opened. Gullies were gradually filled, and the sharp hills leveled. In this same year, R. T. van Horn, for more than 30 years the champion of Kansas City's development, became editor of the Kansas City Enterprise (est. 1854). A board of trade became the Chamber of Commerce in 1857, when the city "was in a neck-and-neck race with Leavenworth and St. Joseph for the rich prize of the great commercial metropolis of the far West." Albert D. Richardson, a New York Tribune reporter, found the levee "a confused picture of immense piles of freight, horse, ox, and mule teams receiving merchandise from the steamers, scores of immigrant wagons, and a busy crowd of whites, Indians, half-breeds, Negroes and Mexicans." Everything wore the accidental, transitory look of a new settlement, and there was "much stir and vitality and the population, numbering two thousand, had unbounded, unquestioning faith that there was the City of the Future." Despite the seeming good times, Kansas City by 1856 had already known two years of incipient civil war. The citizens, mainly Southern sympathizers, were involved in the organization of the Kansas and Nebraska territories. Their resistance to the growth of anti-slavery interests in these areas was fanned by pro-Southern groups elsewhere who sent armed bands into Jackson County. In the spring of 1856, recruits arrived from Alabama, Georgia, and South Carolina, commanded by a Major Buford; soon others came under "Titus of Virginia, Whitfield, Jenizen, Coleman, Bell and others." Fiercely excited public meetings were held. Armed Southerners rode about town shouting "Death to all the damned Yankees." Patrons of the Gillis House on the levee, nicknamed "the Free State Hotel," because it was owned by the New England Emigrant Aid Society of Boston, slept uneasily with "revolvers under our pillows and a Sharp's rifle close at hand." The society hastily leased the building to a strong pro-slavery man. Bands of marauders were organized to raid eastern Kansas; the Kansas "Red-Legs" pillaged and murdered in western Missouri. "Both groups acted in the name of patriotism." The outbreak of the Civil War caused the local conflict to enter a new and more desperate phase. New markets opened as the frontier was pushed into the Far West. Corn and wheat and cattle from the plains supplanted the gradually dying overland commerce. In 1865 the end of the pack train and steamboat era was marked by the coming of the first railroad into the city the Missouri Pacific and a new geographic trump was discovered. The natural water-level grades which the railroads followed converge at the mouth of the Kaw. As Henry Haskell points out: "take a freight car two hundred miles to the northwest, west, or southwest of that strategic point, give it a shove, and it will coast down to Kansas City. That fact determined the location of the future distributing center." Soon a network of lines developed, and along their routes farms and towns grew up. Wheat and cattle became the staple crops of the prairies. When the Missouri cattle trails were closed to Texas cattle, annual drives were made to the Kansas towns along the new railroad lines. In 1870 the first stockyards were built in Kansas City. Within a few years the town became the center of the trade, and packing houses were opened. At first most of the cattle handled in Kansas City were from Texas, but by 1890 Kansas and Missouri furnished the majority. Kansas City, however, never became a typical cow town. A few herdsmen brought something of the cow country atmosphere to the stockyards district, but "the boys in the high heel boots, chaps and spurs" were swallowed up in the larger life of a community busy killing hogs, handling wheat, grinding flour, and supplying agricultural implements to the grain farmers. Kansas City developed as a grain center after the grasshopper plagues of 1874, which made necessary the shipment of corn to Kansas. New capital was attracted. By the next year, when the westward movement of corn ceased, the eastward movement of wheat began. The trade was anchored by the erection of an exchange building in 1877, and a steady growth of elevator and milling activity followed. The city had found its stride. A Union Depot (the second in the world) was erected in 1878, and enlarged two years later. It continued to serve until the present Union Station was opened in 1914. The Kaw was bridged in 1866, and the Hannibal Bridge the first across the Missouri River was completed in 1869, to be supplemented by the Armour-Swift-Burlington Bridge in 1909. The city annexed nearby Westport in 1897. Horse car lines appeared, succeeded by cable cars and finally by the overhead trolley cars which had been invented by John C. Henry of Kansas City in 1884. A convention hall built in 1899 was destroyed by a fire a year later. Its successor was rushed to completion in 90 days, to be ready for the Democratic National Convention of 1900, which nominated William Jennings Bryan for the presidency. An era of park building and public improvements began. Kersey Coates Drive grew out of an almost impenetrable jungle. Vinegar Hill was transformed into the beginning of Penn Valley Park. Kansas City had prospered. The fortuitous bend in the river had given it a head start; the slope of the land had provided a long lead in the race for supremacy. The herders and the traders and the sod corn crew had done their part. The city was not pretty, but it was lively in the lusty Western fashion. Even a Kansas City writer (1879) admitted the city was not "tame," but the determined spirit to make it "the City of the Future," which Richardson had noted a decade before, remained. Then came William Rockhill Nelson, to demonstrate what one man with a fixed idea, a stubborn spirit, and a newspaper all his own, could do. The two decades that followed 1900 brought auto assembly plants and a gradually increasing variety of industries to Kansas City. Stimulated by the World War, business in horses, mules, and cattle reached new heights. Viaducts were completed connecting Kansas City, Missouri, with Kansas City, Kansas. The population increased from 163,752 to 324,410. In 1940 Kansas City was the leading hay market and seed distribution center of the world, the second general livestock market, the first in stocker and feeder cattle, the first in horses and mules. In addition to the traffic of its railroads, more than 100,000 tons of freight are shipped annually over the Missouri River. Kansas City can also pride itself upon many cultural achievements, It established the University of Kansas City in 1935. It is the home of many denominational and specialized schools, among them the Unity School of Christianity, a religious/ethical organization with a large following, which originated and maintains its headquarters here. The concerts of its philharmonic orchestra attract audiences from a wide region. 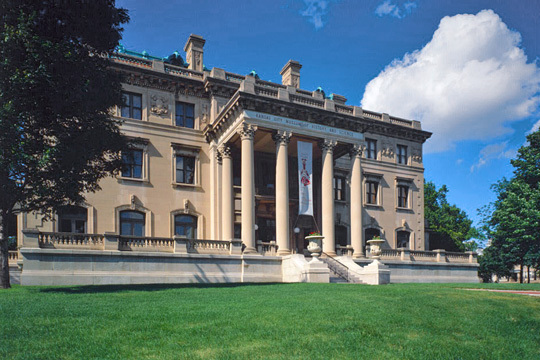 Its William Rockhill Nelson Gallery of Art and Mary Atkins Museum of Fine Arts ranks among the foremost in the country. Robert Alexander Long (1850-1934) lived up to the Horatio Alger myth of the late-nineteenth century. Born to a family of modest means on a farm in Shelby County, Kentucky, Long had become a nationally prominent figure in the lumber industry by the turn of the century. He owned vast holdings of forested land in the state of Washington and a large network of sawmills and lumber yards throughout the south and southwest. Aside from his business interests. Long also played an important role in Kansas City as a civic leader and philanthropist, as well as promoting conservation of national resources. In 1908 Long delivered an address on forest conservation at the White House, having been selected as one of four speakers by President Theodore Roosevelt.